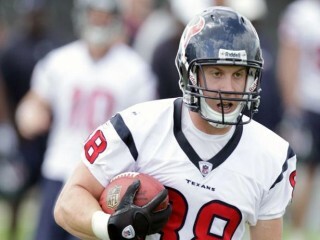 Garrett Graham is an American football tight end who plays for the Houston Texans. He played college football at the University of Wisconsin-Madison (Badgers). Selected by the Houston Texans in the fourth round (118th overall) of the 2010 NFL Draft. Started 33-of-40 games for the Badgers, catching 121 passes for 1,492 yards and sixteen touchdowns…became the 20th player in school history to gain over 1,000 yards receiving in a career and was the fifth Wisconsin tight end to accomplish that feat, joining Travis Beckum, Pat Richter, David Charles and Tim Stracka…only Beckum (159) have more receptions by a tight end in school annals than Graham’s 121 (tied with Pat Richter)…his sixteen touchdown catches moved him into a tie with Chris Chambers (1997-2000) for fifth place on the Badgers’ all-time record list…those scoring grabs rank topped the previous school all-time record for tight ends (15 by Pat Richter) has more touchdown receptions…ranks eleventh in school history with 1,492 yards receiving. Earned first-team All-Big Ten Conference honors from the media and second-team accolades from the league’s coaches…named team co-MVP…midseason John Mackey Award Watch List nominee (nation’s top tight end)…started thirteen games catching a career-high 51 passes for 624 yards (12.24 ypc) and seven touchdowns…his seven scoring grabs tied for eighth on the school season-record list…caught 51-of-74 balls targeted to him (68.92%), as he dropped three attempts and had five others deflected by the opposition…40 of his catches produced first downs, converting 16-of-27 third-down tosses (59.26%)…had 37 catches for at least ten yards, including nine for 20 yards or longer… also came up with key receptions on eighteen touchdowns drives and three possessions that produced field goals…served as one of the team’s four captains. All-Big Ten Conference first-team selection by the league’s media, The NFL Draft Report and CBS Sportsline, earning second team honors from the conference’s coaches…led the team with a career-high 40 receptions for 540 yards and five touchdowns, as it marked the third-straight year a tight end led the team in catches…had a total of 61 passes targeted to him (caught 65.57%), as six of those tosses were deflected by the opposition and 15 others were un-catchable…did not drop any of those throws and did not lose any ground or get tackled for no gain on any of his 40 grab…made seven of his catches inside the red zone, including five on goal-line plays…as a blocker, he delivered 38 knockdowns/key blocks that included eight down field, three touchdown-resulting blocks. Earned his first varsity letter, starting 10-of-13 games in the team’s two-tight end formation, coming off the bench vs. Washington State, Iowa and Illinois…finished second on the team, catching 30-of-47 passes targeted to him for 328 yards and four touchdowns…along with Travis Beckum’s 75 catches, it marked the first time in Wisconsin history that tight ends finished 1-2 in receiving during the same season…24 of his 30 grabs produced first downs, as Graham helped convert 12-of-16 third-down tosses and one other on fourth down…caught eight of his passes inside the red zone, including four on goal-line plays…Registered 31 knockdowns/ key blocks that included seven down field blocks and three touchdown-resulting block…also recorded a solo tackle vs. Iowa. Saw action in three games…made his collegiate debut late in the Minnesota clash and also played briefly in the Buffalo game…saw his most extensive action vs. Arkansas in the Capital One Bowl. 2005: Redshirted as a freshman. Attended Brick Township Memorial (Brick, N.J.) High School, playing football for head coach Fred Sprengel…named to the Associated Press, Newark Star-Ledger and Gannett News All-State teams as a junior and senior…New Jersey Top 25 and National Top 35 prospect selection, earning a four-star rating from Rivals.com…rated the 26th-best overall prospect in the nation by Scout.com…chosen for Prep Football’s All-East Top 60 list…was a versatile performer, as he lined up at tight end and defensive end, in addition to handling place-kicking and punting chores…the two-time team captain and MVP caught 25 passes for 604 yards and ten touchdowns, adding fourteen tackles (10 solo) with a pair of sacks, a fumble recovery and an interception, adding five field goals, including two for distances of 45 and 47 yards as a senior…he closed out his prep career with 2,031 yards and 21 touchdowns on 96 receptions. Sociology major…son of Eileen and Gordon Graham…father played for the West Virginia University soccer team…resides in Brick, N.J.
View the full website biography of Garrett Graham.